During the celebration of Hanukkah, families enjoy a bounty of traditional foods. Those include latkes (potato pancakes), sufganiyot (jelly-filled donut), and other foods to celebrate the Festival of Lights. The holiday celebrates a miracle in which one night’s supply of lamp oil provided light for eight nights during the rededication of the Holy Temple of Jerusalem. Fill your holiday table with these delightful recipes. 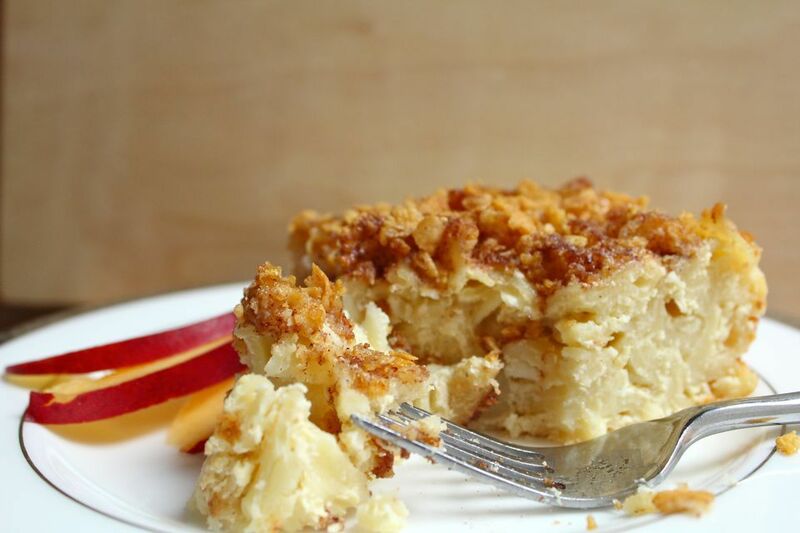 If your bubbe made kugel, this comforting version might taste familiar. Bring it to the new world by topping it with an easy cornflake crumb topping. Captain Crunch or another flaky breakfast cereal would taste great, too. It's creamy, rich, and perfect with a cup of coffee for brunch or as a delightful side dish at your Hanukkah celebration. Traditional Challah bread tastes great any time of year, but it's especially festive for Hanukkah. Don't worry about eating up the loaf at dinner—it makes perfect French toast the next day. This recipe levels up the basic version with raisins and honey. Cardamom adds a nice spice, but you can skip it if you don't like the taste. Pro tip: measure the honey in the same cup you used for the oil and it won't stick! If you've made traditional latkes or potato pancakes, try a cauliflower version this year instead. You may need to adjust the number of eggs depending on the size of your cauliflower. Instead of topping them with traditional sour cream and applesauce, take a page from Indian cuisine and try store-bought or homemade chutney and some cucumber raita. Would any dessert table be complete without hamantaschen? We don't think so! You've probably tried them with a sticky poppyseed filling, but this updated version changes things up with a lemon curd filling and poppyseeds in the dough instead. It's such a classic combination, and you might just never go back once you try these. Yes, you can eat latkes with your hands! At least, you can with this baked version. These are made in muffin cups, so they don't require messy frying and you can serve them as appetizers while the rest of the meal finishes cooking. Try filling them with your favorite latke toppings, smoked salmon, salsa, even avocado and red pepper. The only limit is your imagination. Sufganiyot, or jelly donuts, are served at Hanukkah because the frying oil is reminiscent of the miraculous oil that burned in the temple. And they're surprisingly easy to make at home. Plan ahead, because they do need to rise for about an hour before baking. Make sure your oil comes completely to temperature too to avoid soggy donuts. This sweet potato kugel is egg-free and lower in cholesterol and fat than the traditional version, and it's also vegan and vegetarian-friendly. The combination of sweet potatoes, apples, and raisins gives it a beautiful harvest flavor. Like your desserts on the healthier side? This apple cake may just your style. Made with whole grain flour and less sugar than your standard version, it's a little more virtuous than many recipes. However, it's still got a dense crumb and a lovely spiced apple flavor that tastes perfectly appropriate for the end of a meal or a leftover breakfast the next morning. These easy butter cookies are perfect for little hands to help with, so turn baking them into an activity everyone can enjoy. The soft dough spreads a bit in the oven, so chill thoroughly before baking. You can either roll it and slice it into rounds, or roll it out and use cookie cutters to make festive shapes. Make sure to flour your hands, the cutters, and the work surface thoroughly so it doesn't stick. 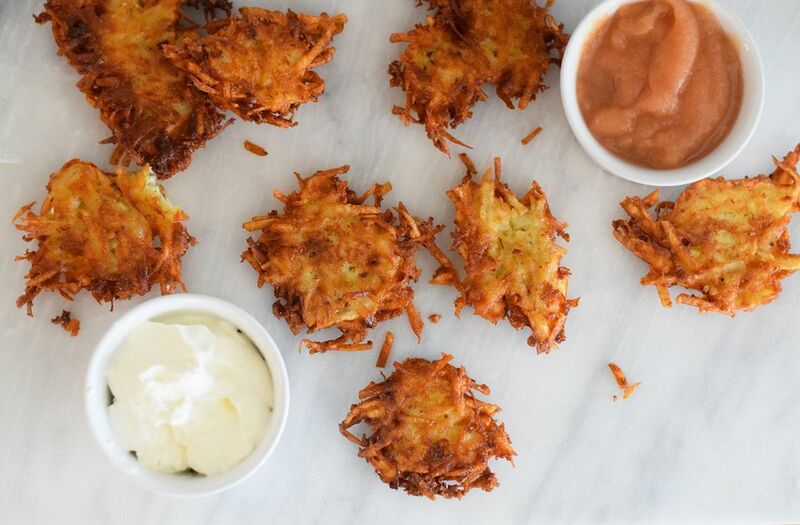 Maybe it's your first time making latkes, or you just need a foolproof basic recipe. This one will make the cut. It uses a food processor to shred the potatoes, giving the finished product a smoother consistency than the hand-shredded version. If you like yours flakier, go ahead and use a box grater instead. What's Hanukkah without brisket? Forget the dry, dense version your mom may have made back in the day and serve this moist grilled recipe finished in a succulent, slightly spicy sauce. Scale back on the jalapeño if you like it a little milder, or add more pepper if you want to really feel the heat. Leftovers make awesome sandwiches the next day. Use oil in an unexpected way with this light, creamy lemon sorbet. Olive oil gives it a luscious texture. Freeze it in a loaf pan and slice it for a pretty presentation. Not used to salted desserts? Start with the recommended 1/2 teaspoon and see what you think. You can always sprinkle more on top if you want it to be more assertive. Cola is the secret to the slightly sweet, slightly savory sauce in this wonderful brisket recipe. It's so simple, you may even have many of the ingredients already on hand. Make it a day ahead and reheat just before serving; the flavor gets even better after some time in the fridge. Both kids and kids at heart will love the surprise dreidel shape in the middle of this sweet bread. Make it with the little ones for a fun winter afternoon activity. The vanilla pound cake is rich enough for dessert or a decadent breakfast. Let the whole family have fun decorating the glaze with sanding sugar or sprinkles. Sufganiyot get all the hype during Hanukkah, but they can be time-consuming to make. If you're just not up for the effort, these baked olive oil donuts are a great substitute and much simpler to put together. You will need a donut pan to make them, but it's a worthy investment if you're going to use it often. These Greek zucchini and feta fritters are just like latkes, but feature squash instead of potato. Try them for a slight variation on tradition, or add them to your table alongside the potato version so you can sample both. Try them with tzatziki sauce for a real authentic flavor. Once you try this chocolate-laced babka, you'll wonder why you haven't made yours with chocolate every year. Sprinkle the top with chopped chocolate for an extra festive presentation, or whip up a vanilla glaze to give it an extra hit of sweetness. For people trying to avoid gluten, Hanukkah foods can be tough. But this tasty kugel uses zucchini "zoodles" instead of noodles, making it allergy-friendly and lower in carbohydrates than the one you're used to. Once you try this version, it just may become your new go-to. Serve the usual challah in a totally new way in this pareve bread pudding recipe that's also great for those who are trying to avoid dairy. It's delicious with non-dairy whipped cream or ice cream, or drizzled with a little maple syrup. Have the leftovers for breakfast—it's the holidays! Use the symbolic oil in a new way with this marinated feta cheese recipe. It makes an excellent appetizer or side dish, and goes perfectly with your Hanukkah menu. Get high-quality feta cheese and a nice olive oil, since this simple presentation really shows off the ingredients. Fresh herbs are best, but dried will work just fine.